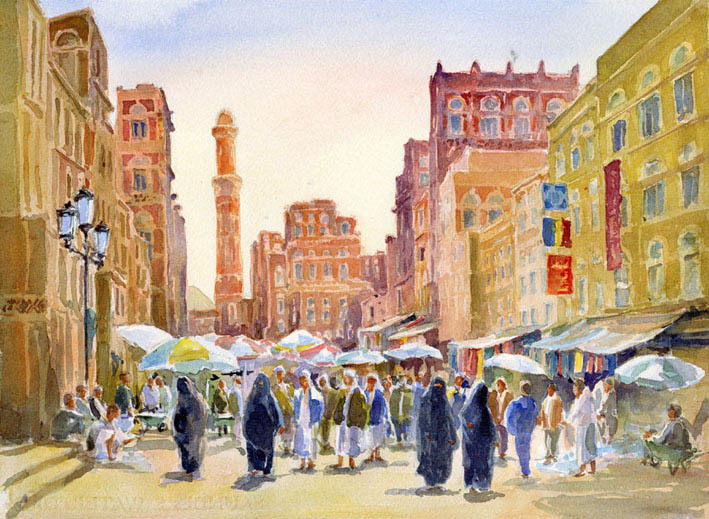 British painter, Charles Foster-Hall, Royal Watercolour Society, London , 2005 winner, presents Yemen like he was one of Yemen’s people through his paintings. Clearly, the creative painter with only couple visits to Yemen, he painted some of Yemen’s historic places and simple day to day life’s details of Yemen, capturing simple yet profound details about the country. Foster-Hall travels most of his time, having nothing in his mind but to paint the places he visits and to present them the way he feels. Regarding visiting Yemen, he said he essentially wanted to present and rejoice Yemen’s beauty the way he felt it. “ My message in my paintings about Yemen is to enjoy beautiful Yemen, the fantastic architecture and its unspoiled originality,” said Foster-Hall. Some of his paintings’ titles he sketched about Yemen are Al Zumor market, Sana’a, The Brothers, Bab al Sabah Street, Sana’a and The Castle at Seyun.